My mum had a cookbook called Half A Can Of Tomato Paste And Other Culinary Dilemmas that sat on our kitchen bookshelf when I was a little kid. (I remember her explaining to me what a dilemma was one night while she was microwaving me some Milo.) If someone were to concoct a book on crafts and pitch it at my particular tastes, it wouldn't be one of those books full of elaborate projects that take nineteen balls of wool apiece. It would probably be called Half A Skein Of Yarn And Other DIY Dilemmas. This week's DIY is one project that comfortably takes care of that kind of leftovers. Felted soap: it's soap, wrapped in wool, that's felted. It's like a soap that's wrapped in a blanket; a blanket that gets sudsy and works just like a wash cloth in the shower. And because wool shrinks in hot water, the felted layer stays tightly wrapped around the soap even as you wear down the bar with use. Felting around soap is easy, and it makes a nice gift. Just make sure to pick a bright color wool — anything brown or grey might make it look like you had a bar of soap that grew mold. And be sure that your wool is, you know, wool. Synthetics don't felt. 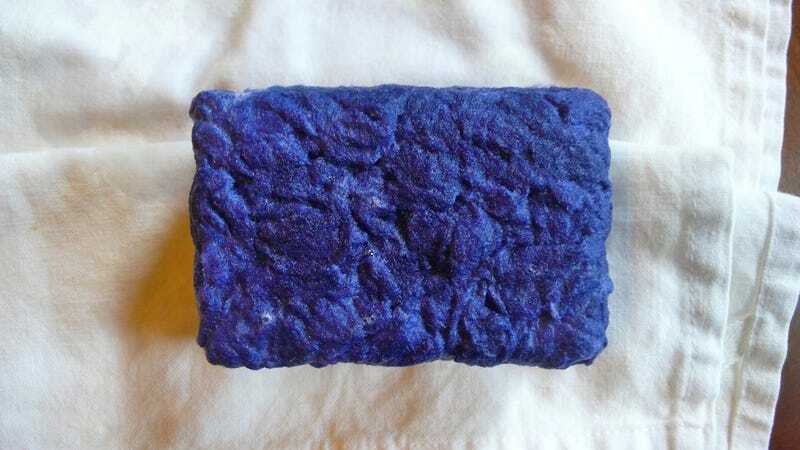 To make a felted soap, all you need is hot water, a bar of soap, and enough wool to cover your soap. You can get felting wool at craft stores — or you can just use some old yarn. This is a purply blue alpaca/wool blend I had leftover from making a shrug. If you wanted to, you could knit your soap a cover, stitch up one end, and felt that. Or, to turn yarn into fuzzy felting wool, you should unwind the yarn, and card it to fluff it up — thicker, not very tightly spun yarn will work better, obviously. Thin yarn probably isn't worth the trouble. To card mine, I used a clean hairbrush. Only the best for moi. Whether you've knitted a onesie for your soap or gone the loose-wool route, run the hot water, or fill a bowl with it. Wet the soap. If you're using loose wool, start wrapping the wool around the soap. The wool will adhere to the surface of the soap. Try to tease out the wool; wrap in several thin layers. Scrub the soap and work the suds through the wool. Soap + friction + heat + the natural qualities of the wool fibre = felt. When your wool layer ceases shifting around on the soap and seems thick and secure, dunk the whole bar of soap in some cold water. When this dries, I'll have a nice bar of blue felted soap.